I know what you’re thinking – “I’ll just rent a Rug Doctor from the supermarket and clean my area rug myself. That’ll save me time and money!” THINK AGAIN! Ruthie here with Arizona Oriental & Specialty Rug Care and I know that most people don’t really think too much about what they do and don’t understand about area rugs. Most people don’t have a strong understanding what “proper care” is for their area rug. If you’ve got a whole lot of luck on your side, you’ll be able to successfully clean your rug without causing damage. But before you take that leap of faith into Luck’s hands, let’s take a look at the whole picture. Unstable dyes leading to color bleed and making a mess of your area rug. Over-wetting the rug and not being able to extract completely due to the low-powered machines can lead to musty odors and mold growth in your area rug. 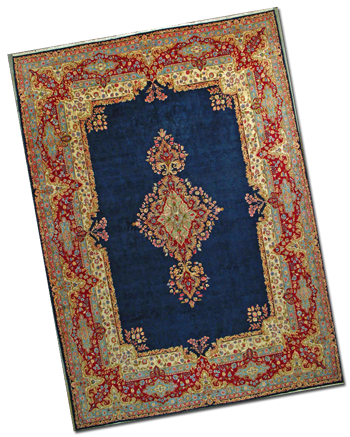 If your rug has animal urine deposits, cleaning your rug at home won’t remove them completely. The added moisture may even cause them to become even smellier than they were originally! Foundation fibers may shrink, causing the rug to become misshapen or even ripple. Fibers may mat down and flatten out, causing the rug to “ugly out” and not look anywhere near as clean as it should! You should also keep in mind that the cleaners that come with the Rug Doctor are NOT designed to clean wool and silk fibers! Cleaning these delicate fibers with cleaners that aren’t WOOLSAFE CERTIFIED can lead to a lot of damage to the fibers, along with everything I’ve listed above. THE MOST IMPORTANT REASON YOU SHOULDN’T CLEAN YOUR RUG YOURSELF? You won’t be able to get it anywhere near as clean on your own as a professional rug cleaning service like Arizona Oriental can! Not only do we have the right tools and cleaning solutions needed to clean fine wool and silk area rugs, but we also have the training, certification, and knowledge about the proper way to clean area rugs. So instead of renting a dirty Rug Doctor machine and taking a risk at ruining your area rugs, give Arizona Oriental & Specialty Rug Care a call today! We will make sure to get your area rug sparkling clean, saving you the hassle and work of trying to do it yourself.